Yep, I've been mentally preoccupied today. I WON'T complain about the heat. Sure, it got up to 97 degrees today with dewpoint of 72, but I can't complain. I at least have a/c. My kids on the other hand are at camp. We dropped them off yesterday. Today, I can only think about them in the heat. Panda is staying in the cabins on the left and working towards her Jr. Lifesaving certification. Since she will be spending her days at the pool, I'm less concerned about her than I am about KC. She's the one "roughing it", in raised platform tents (on the right) with door flaps to provide the circulation and mosquito nets to keep the bugs away while the door flaps are open. The one thing that gives me solace is the fact there have been high breezes today and they are under heavy foliage coverage. At least they aren't in the direct sun. What should have been a quiet break for Doogie and I, has left me in the silence with only my thoughts during the afternoons while Doogie is at work. Boy, I can come up with some awful case scenarios while alone in the silence! Thankfully, I at least have pattern writing distracting my thoughts. I also set the a/c at 80 today to feel less guilty. Send out happy thoughts for my kids (and me), please. First, I'd look for chocolate and wonder what kind of person steals yarn, needles and books! Next, I'd call in a "lifeline" and get a skein of sock yarn and needles to calm me enough to file a police report and be on the lookout for clues. (CSI is HUGE in our household!) Knitting a sock would also come in handy while I call the insurance company (and find myself on hold for long periods of time) to see what would be covered. Finally, I'd say a small prayer that all of my knitting things end up in good homes where they will be loved and flourish. The first thing that I'd replace would be the Fair Isle yarn and pattern that I just received. Some retail therapy to restart my sock yarn stash would also be required. However, I'd promise myself to keep it under 10 sock projects in stash. (Otherwise it starts to get old and I'm less enthused about knitting it up.) I'd REALLY try to use a "just in time" inventory system rather than stashing. Needles: omigosh! 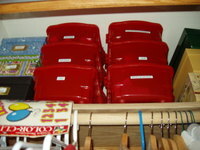 You don't even want to know how many sets of DPNs in size 00 to size 5 I have!!!!! They'd have to be replaced ASAP. Then, the circulars in size 1-4 would be replaced so that I can work on my fair isle project that I just called Knitpicks about (see above) plus all of the Dale of Norway projects that I like to do. However, I would not replace the straights that are in the wine box in the front window shown here. They NEVER get used. When I started knitting, I bought all kinds of these thinking they were the needles most knitters use. I have long since learned that a knitter can use circulars for straight knitting AND therefore need to purchase fewer needles in order to allow for extra money for more yarn. 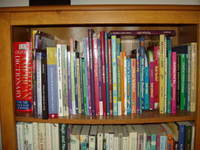 THE WORST part of the whole ordeal would be the loss of books! The top shelf of the bookcase in our living room is almost completely (except for the dictionary) made up of knitting books. That may not seem like much (I do use my library card quite a bit), but these are the ones that, in many cases, I wouldn't want to be without. The most valuable of them is Alice Starmore's Fair Isle Knitting. I managed to get it via Ebay for $75 ( a REAL bargain!). The two that would be at the top of my replacement list would be Nancy Bush's Knitting Vintage Socks and Knitting Rules by Yarn Harlot. In fact, I'd have to make a visit to Harlot's site for a bit of humor to put things in perspective. I'd probably email my story to her but I'd have to be careful about what I'd say. A story posted at Harlot can lead to an avalanche at the mailbox. For proof, check out what is happening to Shelly who asked for help getting leftover sock yarn!) I'd also have to get Beth Brown-Reinsel to autograph another copy of Knitting Ganseys and I'd go back to Knit Camp for an autographed copy of Meg Swanson's Knitting. Basically, everything that I have COULD be replaced and some of it wouldn't be replaced. However, I sure hope the stolen "stash and books" would not include the 30 sheep that have made their way into our home over the course of the last 20 years. These are the four that are currently occupying the table that is next to my knitting chair. 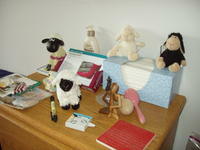 Each of the sheep in our house has a story that accompanies it plus lots of memories are tied to each one. That would be the hardest loss. But isn't that always the case: "things" can be replaced, but "things associated with memories" are irreplaceable! I'll hope that this imaginary thief was only after the yarn, needles and books. 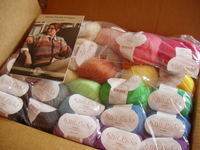 Two weeks ago I ordered the Palette sampler and Fair Isle Cardigan pattern and it arrived last Friday. That evening I got an email from KnitPicks informing me that they were having a really good sale on their Andean Silk sampler. 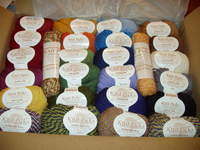 Something about the price and the fact that each of those skeins could be mine to mix and match was irresistable. Look what was in the mail this Friday. Then guess what happened. That's right. A new email tonight from Knitpicks. This time, they are introducing their new yarns. Plus, they have come up with their own line of knitting bags. I can't. I mustn't. What kind of cruel joke is it this!?! In other news, Yarn Monkey is playing hostess again. This time she is organizing Sock Wars. It's like a giant paintball game for sock knitters. Each participant is assigned a "target". The goal: to "hit" them with a pair of socks before you are hit by someone else. It should be a lot of fun. PS The doctor was in and the medical forms are now signed. Just need to pack...but first, a trip to the zoo. I came close to losing the "Perfect Mommy" award today. (What, there isn't an award!?! That stinks!) My daughters leave for camp on Sunday. Today (Thursday) I pulled out their checklist. Some of you will say, "You're still ahead of the game." Others of you, "How could she leave that until the last minute!?!" The checklist includes a medical form that must be signed by the practitioner (I'll get the signature tomorrow...keep your fingers crossed and HOPE!). The camper must have been to see medical personnel within the past TWO years. No sweat for Panda- she had an exam last year in order to participate in sports. However, KC hasn't needed to see the doctor since she needed an exam in order to enter kindergarten- FOUR years ago! Uh-oh!!! Now, I'm not complaining. I'm grateful that my kids are really healthy and (thankfully) have only ever needed to see the doctor for required exams for school, camp, and sports. Otherwise they'd never get to the office. But, how am I going to get KC in for an appointment TOMORROW!?! Ahhh, saving grace: the healthy kid NEVER managed to get chicken pox. On 8/14/04, we finally broke down and she got the shot. That means she saw the doctor 8/14/04. Whew! We squeek under the 24 month stipulation!!! My award (if only in my mind) is safe. There was a time in my life where I would have had the forms all filled out in May when I received them. This time, I opted to wait until closer to camp. Knitting has taught me to sweat the important things, like gauge, and let the other details work themselves out. But, never did I think that I'd cut it this close! Oh well. It'll be fine. 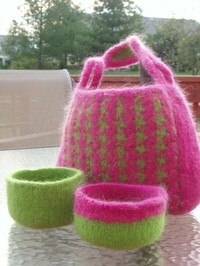 Last night, I finally attempted the felting of my Lindy Bag and One Skein bowls. At least those won't be left until the last minute. Good thing too. Now I am on the hunt for a sweater shaver. The bag is SO fuzzy! It'll need a shave before it heads to my KSKS pal's home! 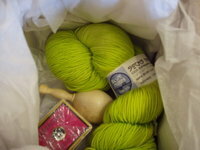 The green bowl is headed to my One Skein pal's home along with some candy and a few other treats. Once again, I am pleased to report that these items were felted in a FRONT LOAD washer. Three cycles is all it took. I didn't catch the washer before it got to the spin cycle so these were nearly dry when they came out of the washer. Maybe while the girls are at camp I'll get ALL of my final packages ready for the August shipment dates. Then we can plan for "Back to School!" But first...thank you One Skein Pal. I received a lovely skein of aqua yarn that was "grown" in Canada. (That's what the label said; grown.) It comes from Custom Woolen Mills in Alberta. This particular skein is Aran weight Mule Spinner yarn. Thanks Pal. There is either a felting project that this will become or an American Girl Doll Aran sweater. I'll keep you posted. No, this is not the question. Next, I have a lace project. Yes, a lace project. I'd really like to make the Pacific Northwest Shawl. But I've never worked lace before. So in my recent KnitPicks order, I also received two skeins of Shadow lace weight to make the Shadow Scarf. I saw SO MANY scarves like this when we were in Europe. Having one for myself for this fall is the plan. So far, I've completed ten of the 78 inches. It's a fairly straight forward feather and fan design, but I'll get bored if I only work on it until it's finished. So here it is. For the first time, I will cast on a second project and only work on this 1-2 inches per day. I'm trying to decide what to cast on to share time with it. But that's STILL not the question. SO here it is...at long last...the Question that has been put to members of my SP8 group...Someone has stolen your stash and all your books: now what are you going to do? Assuming you don't let the experience discourage you from ever knitting again, here are some additional items to consider...What would be the first thing you'd replace? What would you decide to live without? Think about it. Post your answers in the comments section or let me know that you've posted on your blog. I'll post my own answer here on Saturday. A number of you were bothered by the frog/toad photo. I thought you should know that we did more than just hike in the woods with our German friends. We had a bonfire and made smores. Yum! Since it was warm out, we went to the lake and played in the water. They were surprised by the cool water temperatures and that it wasn't salty. Sure, it looks like an ocean, but it surely isn't. Most importantly, we had lots of food, fun, and conversation! That's what it's all about anyway. I did manage to finish the socks that I'd designed for KSKS. The pattern will need a couple of modifications but overall I'm pleased with them. This pair will be heading out in the mail to my Other SP. She knits a lot of socks for her family, but I've seen very few for her. I hope she likes these. (Thanks to my model: Fairy Godmother's daughter.) The surprising thing is that it's the 25th of the month and these are the first socks that I've completed this month: #15 for the year. I'm nearly caught up with my blog reading. Tomorrow will be update day with a question for my SP participants to answer. I'll post it here for all of you as well. It's a good one so come on back tomorrow. Just a quick note. Fairy Godmother and her daughter (bet you didn't know that Fairy Godmothers had daughters!) brought our German friends to Chez Krafty for a visit. It has been such a busy, wonderful weekend with no postings currently available. My Sunday ritual of reading the blogs of the SP8ers in my group has been postponed (so there's still time to get your weekly updates in). We will return to our regular programming in the next 24 hours. 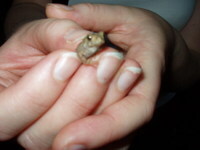 In the meantime, enjoy this photo of the tiniest frog/toad (I used to know the difference) I've ever seen. We found it on our hike in the woods. It's the only frogging that occurred here this weekend. See you soon. Thanks again to the postal system, I won't need to bore you with scrapbook details. My Knitpicks order came. This was my reward for finishing the World Cup pullover. I've wanted to make the fair isle cardigan since I first saw it in the catalog. Then, over a month ago, we had our garage sale with enough quilting material being sold to MORE than buy the cardigan kit. I'd say that was quite a bit of willpower. Now it's here and I can't WAIT to get started on it. But first there is the matter of a sock. The second sock still needs finishing. Then there is the matter of pattern revision so that I can write up the pattern for my KSKS pal. By mid-week there WILL be a cardigan cast on. This week, thanks to my Secret Pals, I actually have knitting related content to blog about. Look what was in my mailbox today. Thanks to my Other Secret Pal, there was this wonderful box with Socks that Rock (color: limeade), a box of rasberry tea, and a darning egg (I can't wait to try it on the current socks). I got a kick out of her note. She mentioned that if I don't care for the color that I could always exchange it. As many of you know, green is not one of my regular colors for things that I knit myself. But, I'm always intrigued by this shade. You see it everywhere! I'll have to give it some careful consideration. Thank you, OSP! Thanks to Knittin Mom, I have some knitting to look forward to. She is hosting Sock-A-Month 2 from August through January '07. I'm so glad that I'll have a reason to make sure that I continue to eliminate sock knitting stash. I've been on a sock yarn diet since the beginning of the year and have lost much "weight". (Then again, I haven't gained much either, thanks to the Sock a Month plan.) I should really "weigh-in" at the end of this month and post the results. Any guesses? I started the year with 25 pairs worth of sock yarn...how much stash is in my drawer now? (I've knit 14 pair, another nearly finished, and given two skeins to my DH. Let me know your guess. There may even be a sock prize for the winner. As we drove up to the house there, in the front door, was a USPS box. My SP had written to say a package would be arriving from the UK but the USPS box through me off for a few minutes. Good job! (Pal: not only did you fool me, but you recycle!) Look what was inside. First out of the bag was...Loch Ness Scotch. I remember seeing this when we were at Loch Ness. Cool. Next out of the bag was... Shaun! After his long trip, he is now clinging to the scotch. I had intended to take a photo of each item as I unpacked but there was just SO much! Baasil (a sheep bookmark), soap for me AND Isle of Skye soap for KC, bamboo sock yarn (which I've never seen) in a travel bag along with the needles to knit socksthem and an insert for making a sock bank. 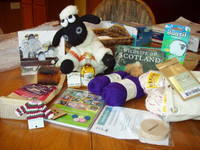 There was a 2007 sheep calendar, a book of Scottish animals, some pretty buttons, and a cute Alex Clark card. SP says this is my final package due to the value and BOY! There was plenty there! Thank you, thank you, thank you Pal. I'm busily cutting pictures and papers to take care of our scrapbook. I've found a new use for my old quilting rulers, cutter and cutting mat. So far I've completed 13 pages of the 50 that there are. It may not be finished by this weekend, but it will be MUCH further along than it was last weekend.